The “Can Do” Chefs Club received an invitation from Miss Sue to make lunch for the kindergarteners on International Day at the “Can Do” Street Community Center. “Huh,” said Hector. “Wow, that’s hard, “said Nellie. Kathy just looked blank as she tried to think of something to make that would fit an International Day and that young kids would be willing to eat. Then Yundi said,”I’ve got it,” said Yundi. “We make an Asian lunch. We serve sushi and teach the kids to use chopsticks.” The rest of the Chefs Club members just stared at him and Kathy said, “What little kid, that isn’t Asian, would eat raw fish?” everyone laughed, even Yundi. Yundi said,”We won’t make sushi with fish. We’ll make peanut butter and jelly sushi rolls.” And that is just what they did! Oh, the kindergarteners just loved it! Miss Sue was so pleased and all the parents were so impressed with what the “Can Do” Chefs Club members managed to do for International Day. 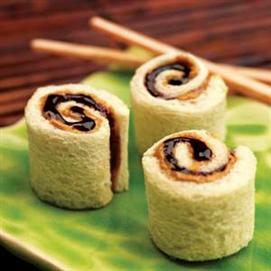 Why not be a “Can Do’ Chef and make your own peanut butter and jelly sushi rolls and serve them to your family?